Payroll Mate is a complete payroll software solution designed for the needs of small to medium-sized businesses as well as accountants. It automatically calculates Medicare tax, Social Security tax, federal tax withholding, net pay, and user-defined local and state taxes. In addition, the tool prepares forms 941, 944, 943, 940, W2 and W3, prints payroll checks, and supports a range of pay periods. It also supports user-defined Deduction, Tax, and Income categories. Payroll Mate is a robust and flexible tool that offers add-on options such as MICR checks and direct deposit capability, and generates W2 forms on blank paper. The application can also generate forms Illinois UI-3/40, Illinois IL-941, New York NYS-45, Texas C-4, Texas C-3, California DE-7, and California DE-6. In addition, it exports payroll data to other accounting solutions such as Microsoft Accounting, Quicken, and QuickBooks. Payroll Mate is an on-premise payroll management platform designed for the needs of small and medium-sized companies. It assists you to automatically calculate state and federal payroll taxes. The software supports multiple pay-frequencies (monthly, semi-monthly, and bi-weekly pays) and payroll formats (e.g., bonuses, overtime pay, hourly pay, and regular salary). Payroll Mate allows you track and calculate sick and vacation time, and utilize this information to calculate monthly salary for employees. In addition, you can export employee payroll data to third-party accounting programs such as Sage 50 and QuickBooks so you can prepare financial reports like general ledger and others. The software’s reporting module allows you to prepare comprehensive employee payroll reports such as journal, tax liability, employee earnings, and state taxation reports to help your company make educated decisions on employee payroll management processes. Organizations have unique needs and requirements and no software application can be just right in such a situation. It is futile to try to find a perfect out-of-the-box software product that fulfills all your business needs. The smart thing to do would be to adapt the system for your specific needs, employee skill levels, finances, and other aspects. For these reasons, do not hasten and invest in well-publicized trendy solutions. Though these may be widely used, they may not be the best fit for your unique needs. Do your homework, investigate each short-listed system in detail, read a few Payroll Mate reviews, speak to the vendor for clarifications, and finally select the app that presents what you require. How Much Does Payroll Mate Cost? Please note that none of these options can be used stand-alone. We realize that when you make a decision to buy Payroll Software it’s important not only to see how experts evaluate it in their reviews, but also to find out if the real people and companies that buy it are actually satisfied with the product. That’s why we’ve created our behavior-based Customer Satisfaction Algorithm™ that gathers customer reviews, comments and Payroll Mate reviews across a wide range of social media sites. The data is then presented in an easy to digest form showing how many people had positive and negative experience with Payroll Mate. With that information at hand you should be equipped to make an informed buying decision that you won’t regret. What are Payroll Mate pricing details? 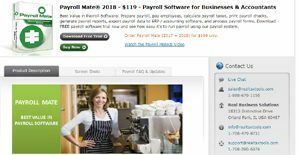 What integrations are available for Payroll Mate? If you need more information about Payroll Mate or you simply have a question let us know what you need and we’ll forward your request directly to the vendor.